You can import existing material into Booktype. Currently two import formats are supported: EPUB and Office Open XML (.docx). ePub, short for Electronic Publication, is an open standard e-book format, that has the ability to optimise the text display for whichever device is viewing the book. ePub documents can be read by several different devices, including the Kindle, iPhone, iPad and any computer with ePub reading Software installed. Booki has the ability to import any document in ePub format. NOTE: although ePub is an open format, not all books available in ePub format have open licences. Therefore, care needs to be taken when choosing to import an ePub document to ensure that it contains a permissive copyright. 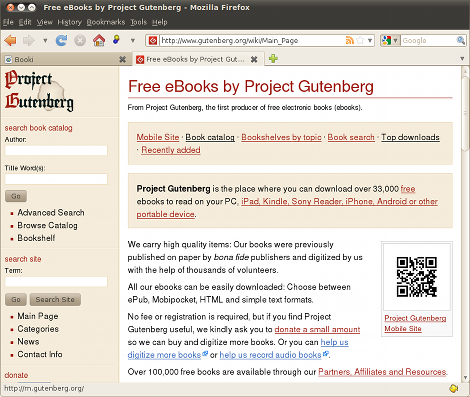 Project Gutenberg (http://www.gutenberg.org/) is a good place to start looking for openly licensed books in ePub format. It is an organisation dedicated to making books freely available in forms the vast majority of users, hardware and software can easily read, use, quote and search. To import an ePub document, first you need to get the url for the ePub book, then copy its location. Then on your My Books tab click on Import Book select Import epub from the drop-down list. Paste the ePub URL into the enter epub URL text box and click on Import. Once the process has finished the imported book will be added to the list of books on your My Books and Dashboard.